Gonzalo Higuain bagged his first goal for Chelsea as they took an early lead in their clash with Huddersfield at Stamford Bridge on Saturday. The Blues needed to respond this weekend after their heavy defeat to Bournemouth in midweek, and they got off to the perfect start courtesy of their January loan signing. 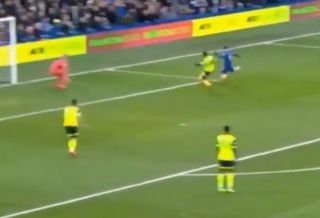 As seen in the video below, N’Golo Kante played a crucial role in the goal, as he produced a brilliant reverse pass to find his new teammate down the channel getting in behind the defence. However, Higuain still had plenty to do from that angle, but the prolific 31-year-old made it look easy as he drilled his effort into the back of the net to ease some of the tension at Stamford Bridge. Chelsea boss Maurizio Sarri will be hoping for plenty more goals from his new recruit, having guided him to the most prolific campaign of his career to date when the pair worked together at Napoli previously.